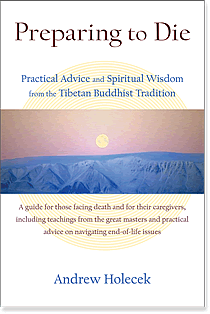 Shambhala Publications has just released a new book entitled Preparing to Die by Andrew Holecek which includes an interview with Mindrolling Jetsün Khandro Rinpoche in which she shares her thoughts on confronting death— one’s own or the end of life for others. This title is available directly from Shambhala Publications at http://bit.ly/1bsHDXu. We all face death, but how many of us are actually ready for it? Whether our own death or that of a loved one comes first, how prepared are we, spiritually or practically? In Preparing to Die, Andrew Holecek presents a wide array of resources to help the reader address this unfinished business.